Harambee Stars captain Victor Wanyama has finally paraded his newly acquired Sh25 million worth toy.The Tottenham Hotspur midfielder who is in the country on holiday following the lapse of the 2016/2017 English Premier League season, on Saturday made his way to the national football team’s camp at the Kenyatta Stadium in Machakos in a note Crafter CR53 Maxi.Harambee Stars are preparing for a crucial 2019 Africa Cup of Nations qualification opening way to Sierra Leone next saturady in Freetown. The German machine arrived in the country sometime last year, but Wanyama and his family have barely used it. 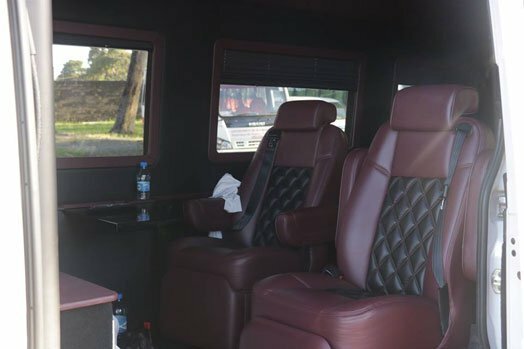 This van, which attracted excitement across the handful of supporters in attendance at Machakos, is reported to contain a fridge, coffeemaker, 3D TV screens for sports channels paid for on a monthly basis, interior and exterior CCTV cameras, a play-station and 10 seater rotating seats, each designated for the player’s ten member family. Up until now, Wanyama who had a stellar season in the just concluded English Premier League season. He has consequently received praises from the likes of former Arsenal legend Thierry Henry. During his recent trips home Wanyama has often been chauffeured around town in his elder brother Macdonald Mariga’s Cadillac Escalde Platinum 2011. Besides these two costly machines, the Wanyama family’s parking lot also has a Jaguar, Hummer, Lexus V8, BMW, two Lexus cars among other. WANYAMA PARADES HIS NEW CUSTOM-MADE SH25M CAR – PHOTOS Reviewed by samrack on June 5, 2017 .